Orchestre des Champs-Élysées with Philippe Heerenweghe and concertmaster Alessandro Moccia (?) (left), receiving applaus 14th. March, celebrating its 25 years Jubilee with all Beethovens 9 symphonies. PARIS/FRANCE: During 4 evenings, with one free evening in the middle we are attending the Orchestra des Champs Élysées performing all 9 of Ludwig van Beethoven symphonies. 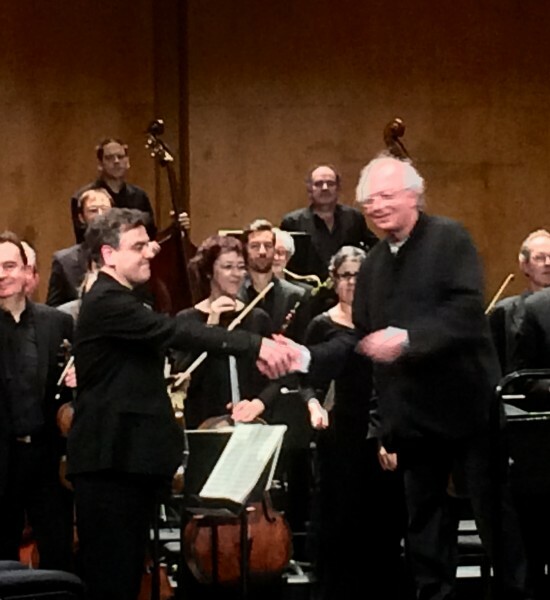 conducted by Philippe Heereweghe. – Honestly that gives me a Ring des Nibelungen feeling. I feel privileged and honored to get such an extraordinary possibility in the Europen Capital of Art and Music – Paris. 14-18. March 2017. At the same time this wonderfull orchestra celebrates its 25 years Jubilée. It all started Tuesda7 14th March with Ludwig van Beethoven 1. 4. and 7th Symphonies, Musically well formed, very good energy and beautiful colours in the wind and brass, and delicious timbale details by Marie-Ange Petit. Alessandro Moccia (?) was concertmaster. It continued Wednesday 15th. with the 2. and 5th Symphonies- still playful and with great elegance, and the same good energy as on Tuesday, No 5, specially excellent from the Winds. Then a break day, and Fridad 17th it will be Symphonies no 6 – Pastorale, and no 3 Eroica. Orchestre des Champs-Élysées with Philippe Heerenweghe at the podium receiving applaus 14th. March celebrating its 25 years Jubilee. It all end Saturday evening with Symphonie no 8. and 9th. Ode a la Joie . ( which has been adopted as The European Hymn). In the last a great gallery of soloists, Christina Landshamer, sopran, Stefanie Schmidt, mezzo Maximilian Schmidt, tenor and Thomas Bauer, baryton, and the Collegium Vocale Gent.